On June 26th, the Cheung Kong Graduate School of Business (CKGSB) hosted its third annual Women in Leadership Forum designed to promote gender equality and women in leadership roles across industries. Over 500 people attended the event, and close to a million more watched online. Held in partnership with UN Women, the full-day event featured speeches from high-profile women in business, politics, philanthropy, and the creative industries. 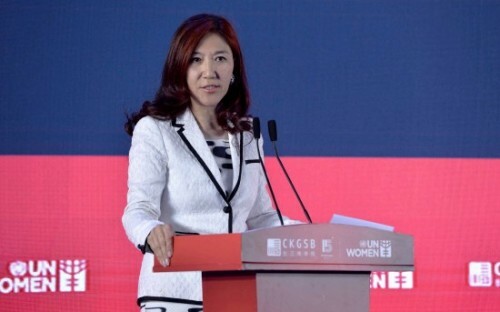 Speakers included Julie L. Kavanagh from the US Embassy Beijing; Wei Sun Christianson, CEO of Morgan Stanley China; Gill Zhou, vice president of IBM China; actress and philanthropist Tao Hong; and Liu Nan, successful entrepreneur and CKGSB alumna. “CKGSB is committed to advancing women’s empowerment and, particularly, women in leadership roles,” says Xiang Bing, the school’s founding dean. In 2015, 46% of full-time MBA students at CKGSB were women – far above national and global averages. The CKGSB MBA Scholarship for Future Women Leaders offers up to $8,800 in financial aid for high-potential women MBAs. Among CKGSB’s more than 40 full-time professors, 22% are female. On average, 21% of CKGSB’s Executive MBA students are female. These figures are significant considering that 80% of CKGSB EMBA students are at vice president level or above. The school boasts an impressive array of female students and graduates. More than half of CKGSB’s 10,000-plus alumni are at CEO or chairman level and, together, their companies’ revenues account for one sixth of China’s GDP. Li Na, two-time Grand Slam tennis champion and former women’s world number two, has just enrolled on a two-year program for senior management executives. At the Women in Leadership Forum, panel discussions on women in media and entrepreneurship included elite CKGSB alumnae like Maggie Tan, former co-head of strategy and planning at Uber China; Cindy Mi, founder and CEO of VIPKID; and Zhu Yueyi, founder and CEO of Reflower. Another female entrepreneur, Felicia Guo, decided to pursue the 14-month full-time MBA program at CKGSB in 2014. Before business school, she’d started up her own art gallery in her native Indonesia. During her MBA, she bolstered business skills and professional network – she met her two current business partners at the school. Since CKGSB, Felicia’s opened a new contemporary art Chinese art gallery in Beijing, and is exhibiting internationally. She’s also co-founded Idart, an online platform for art collectors and investors. “I gained a lot [at CKGSB],” she says. “I think the most important thing is, not just the network, but the true friendships that you are able to form with your classmates over the 14-month MBA. The CKGSB community continues to take steps to promote women in leadership roles in business. Another famous CKGSB alum, Alibaba founder Jack Ma, is leading the charge, bringing more women into the boardroom. There’s still plenty of work to be done. At the Women in Leadership Forum, Tim Payne – senior partner and head of Asia at Brunswick – highlighted how less than 10% of boardroom seats in China are occupied by women. Still, backed by CKGSB’s latest contribution towards female empowerment in business, the winds of change are blowing across corporate China.